Struggling what to give someone as a gift? Sometimes finding time to get to a salon can be difficult. With Pure Opulence Beauty, I come to you so you don’t need to take as much time out of your day, or evening with travelling time. Gift vouchers can be purchased in monetary denominations or by treatment. 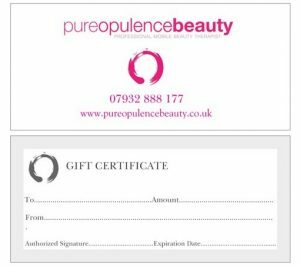 To buy your voucher simply contact me on 07932 888177 or email me at natasha@pureopulencebeauty.com. View the treatments available from Pure Opulence Beauty.